376 - Wayne Salzmann: How to seek and create your own opportunities - Drummer's Resource: Conversations with the world's greatest drummers and music industry pros. Wayne Salzmann may not be a household name yet, but I’m guessing that’ll be changing soon. Far from a newbie in the game, Wayne is one of the most in-demand sessions and live drummers in Austin, TX and is best known for his touring work with Grammy Award winning artist, Eric Johnson. Wayne has also racked up an impressive resume, performing and/or recording with with Steve Miller, Kenny Rogers, Kris Kristofferson, Christopher Cross, Eric Johnson, Joe Satriani, Mike Stern, Joe Bonamassa, Bobby Mcferrin, Robben Ford, Albert Lee, Ray Benson, Dale Watson, Charlie Sexton, Chris Potter and a long list of others. 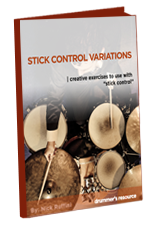 I'd love to hear your thoughts on how I can make Drummers Resource better. 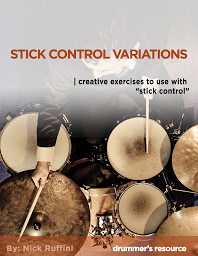 Get your copy of "Stick Control Variations"
when you join the mailing list.